Thanks to a loophole that subsidizes CEO pay, McDonald’s, Yum Brands, Wendy’s, Burger King, Domino’s, and Dunkin’ Brands trimmed $64 million from their tax bills in 2011 and 2012. The fast food industry is notorious for handing out lean paychecks to their burger flippers and fat ones to their CEOs. 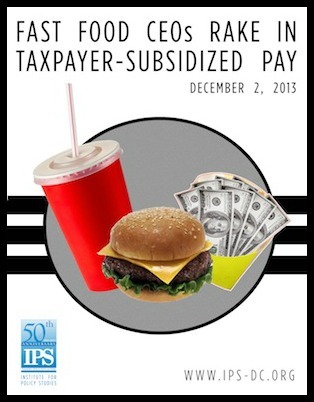 What’s less well-known is that taxpayers are actually subsidizing fast food incomes at both the bottom — and top — of the industry. Take, for example, Yum Brands, which operates the Taco Bell, KFC, and Pizza Hut chains. Wages for the corporation’s nearly 380,000 U.S. workers are so low that many of them have to turn to taxpayer-funded anti-poverty programs just to get by. The National Employment Law Project estimates that Yum Brands’ workers draw nearly $650 million in Medicaid and other public assistance annually. Meanwhile, at the top end of the company’s pay ladder, Yum Brands’ CEO David Novak pocketed $94 million over the years 2011 and 2012 in stock options gains, bonuses and other so-called “performance pay.” That was a nice windfall for him, but a big burden for the rest of us taxpayers. Under the current tax code, corporations can deduct unlimited amounts of such “performance pay” from their federal income taxes. In other words, the more corporations pay their CEO, the lower their tax burden. Novak’s $94 million payout, for example, lowered YUM’s IRS bill by $33 million. Guess who makes up the difference? My new Institute for Policy Studies report calculates the cost to taxpayers of this “performance pay” loophole at all of the top six publicly held fast food chains — McDonald’s, Yum, Wendy’s, Burger King, Domino’s, and Dunkin’ Brands. Combined, these firms’ CEOs pocketed more than $183 million in fully deductible “performance pay” in 2011 and 2012, lowering their companies’ IRS bills by an estimated $64 million. To put that figure in perspective, it would be enough to cover the average cost of food stamps for 40,000 American families for a year. After Yum, McDonald’s received the second-largest government handout for their executive pay. James Skinner, as CEO in 2011 and the first half of 2012, pocketed $31 million in exercised stock options and other fully deductible “performance pay.” Incoming CEO Donald Thompson took in $10 million in performance pay in his first six months on the job. Skinner and Thompson’s combined performance pay translates into a $14 million taxpayer subsidy for McDonald’s. What makes all this even more galling is that these fast food giants are pocketing massive taxpayer subsidies for their CEO pay while fighting to keep their workers’ wages at rock bottom. All of the big fast food corporations are members of the National Restaurant Association, which is aggressively working to block a raise in the federal minimum wage to a level that would let millions of fast food workers to make ends meet without public support. There’s an easy solution to the perverse “performance pay” loophole. A bill introduced by Senators Jack Reed (D-RI) and Richard Blumenthal (D-CT) would simply set a firm $1 million cap for executive pay deductions — with no exceptions. Corporations could still pay their CEOs whatever they choose, but at least taxpayers wouldn’t be subsidizing anything above $1 million. The Joint Committee on Taxation estimates this legislation would generate more than $50 billion over 10 years. It makes no sense for employees of highly profitable giant corporations to have to rely on government assistance for basic needs. It makes even less sense for ordinary taxpayers to subsidize the CEOs who are benefiting most from the fast food industry’s low-road business model. With Congress again mulling deficit-reduction strategies, it’s high time that Washington stopped letting fast food giants gorge on both of these absurd subsidies. This entry was posted in Inequality and tagged Corporate Subsidies, Greed, Income Inequality, Inequality by Larry Shivers. Bookmark the permalink. Doesn’t surprise me in the least…However I’m surprised that Yum Brands is getting anything being a Chinese owned company. Reblogged this on Bishop Eddie Tatro's Study.